Days after both the Atlantic and the National Review published editions focused on the issue of mass incarceration, Keith Humphreys noted a report issued by the Department of Justice with the headline: U.S. is at a 13-Year Low in Imprisonment. 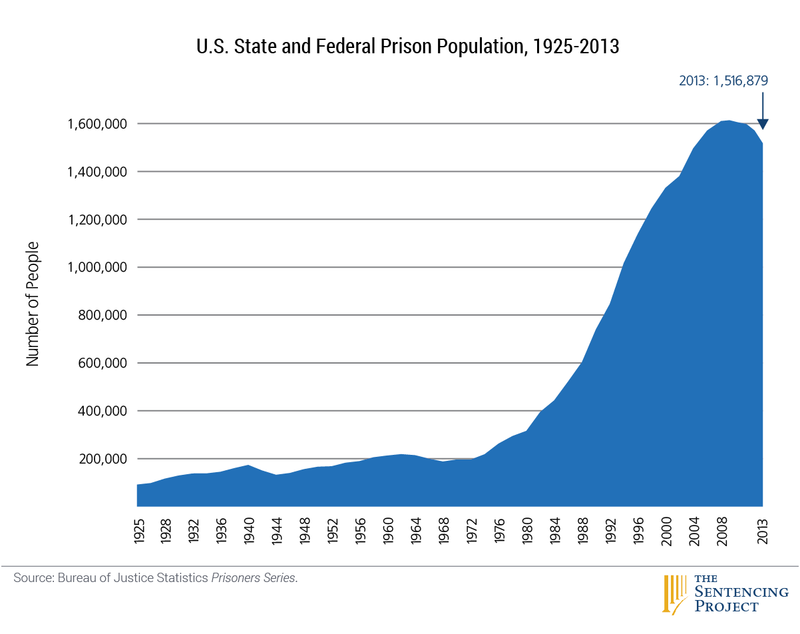 The U.S. imprisonment rate has fallen for the sixth straight year. In 2014, the rate fell to a level not seen since 2001. A 13-year low sounds good. And it certainly represents progress. But to get a picture of what that means, take a look at the trajectory over the last 40 years (note: this chart does not include 2014 numbers). I have written before that, when we look at statistics like this, there are many different ways of representing the numbers. The above chart looks at the raw number of prisoners. Another way to tell the story is to mitigate for population increases by providing the number of prisoners per 100,000 adults in the U.S. That number dropped from 621 to 612 in 2014. 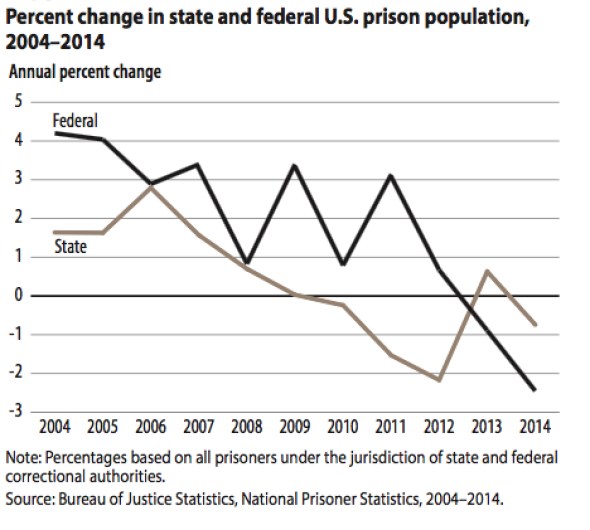 The DOJ report combines the number of people in federal prisons with those in the states. Leon Neyfakh provides us with the more recent trajectory of those two populations (in this case, the data is provided as a percentage change). Neyfakh notes that, while the federal government houses 13% of prisoners, the more recent reductions there account for one third of the total decrease. He also provides some interesting information that suggests that this might be related to federal initiatives to end the war on drugs. Contrary to the messaging we’ve been seeing from politicians interested in criminal justice reform, more than half—about 53.2 percent—of the people serving time in state prisons were there because of violent offenses, and only about 15.7 percent were there primarily because of nonviolent drug crimes. In the federal system this was reversed: about 50 percent of federal prisoners were doing time on nonviolent drug charges, and about 7.3 percent were there for violent crimes. As more and more states take up the task of criminal justice reform (even very red ones), it should come as no surprise that those with the highest rates of over-incarceration will exhibit the greatest gains. Hence, the number one state for prison population reduction is Mississippi (-14.5%). Neyfakh also identifies those who have seen the biggest increases. Notably, the three states that saw the biggest increases in their prison population—North Dakota jumped by 9 percent, Nebraska by 8.3 percent, and Hawaii by 4.2 percent—are small ones, where it doesn’t take much to move the needle by a lot. In summary, the good news is that we are finally on the right trajectory for addressing this problem. We’ve still got a long way to go and – as Ta-Nehisi Coates pointed out – the solutions will be much more complex going forward. But this is one more example of change that is moving in the right direction.